The DV is an inline mounted flow control valve which controls the flow by adjusting the cross-section. 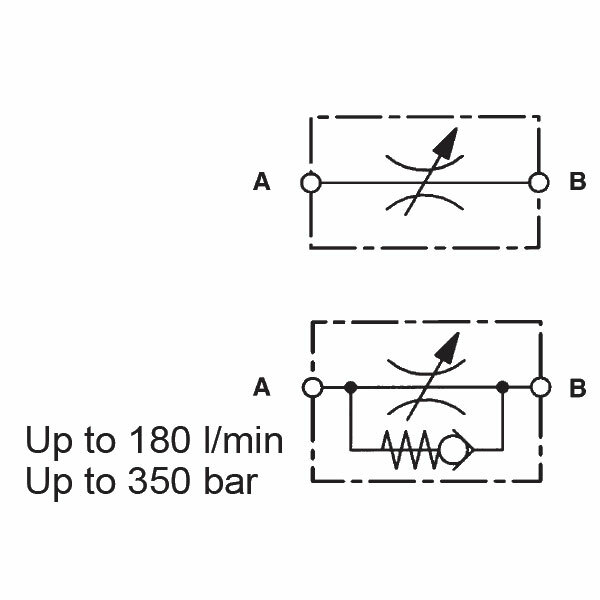 The flow rate is dependent on the pressure differential and viscosity. Starting with the throttle spindle in the fully closed position, the flow rate increases in accordance with the appropriate curve as the control knob is turned. Therefore, the control of the flow is in both directions. The scale on the lower edge of the control knob enables accurate repeat setting. Moreover, the DRV is a flow control valve in the same design. So, it also allows the same fine flow adjustment, but in one direction only. Unrestricted flow in the reverse direction is via the built-in check valve (cracking pressure 0.5 bar).